I've long been a fan of Chilean Pinot Noir. Why? because their coastal climate and proximity to the the ocean along with some pretty amazing cool climates and diurnal shifts make it a perfect place for growing Pinot. In Fact, I'm actually quite surprised it hasn't become a total bombshell yet in the wine business. 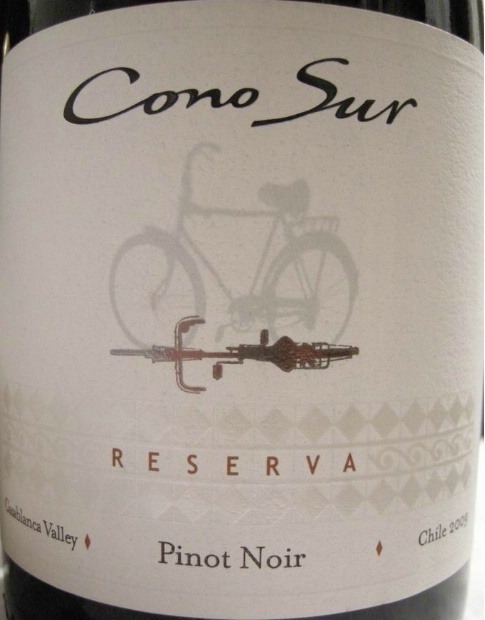 The 2010 Cono Sur Reserva Pinot Noir is from Chile's Valle de Casablanca region. The region is located 47 miles northwest of Santiago and viticulture is possible there because of the cooling influence of the Pacific ocean, in the way of cool morning fog and greater cloud cover than is found elsewhere in the north of Chile. It's fun to taste a wine that already has five years of age on it and is starting to mature. On the nose the wine is unique in that it expresses a gorgeous wild rhubarb and strawberry, but also exudes pleasant aromas of sauteed mushroom and a pinch of oregano. There is also a plummy note and a slightly stewed essence that will make the consumer understand it's beginning to mature.